The Neon Museum presents the largest shared augmented reality experience of its kind, with more than 40 signs “magically” re-electrified. "Brilliant!" 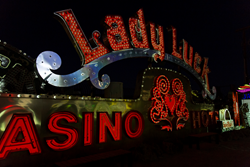 The Neon Museum's new immersive experience that uses technological advances to re-illuminate iconic neon signs. “This is truly a first. Nowhere on the planet has anyone attempted to create what we are about to launch at the Museum,” explained Rob McCoy, president and chief executive officer, Neon Museum. Today, the Neon Museum will debut “Brilliant!”—an audiovisual immersion experience that uses technology advances to reanimate 40 monumental examples of the museum’s iconic vintage signs. Presented after dark in the Neon Museum’s North Gallery, “Brilliant!” was created by digital artist and designer Craig Winslow using projection mapping to arrive at a shared augmented reality experience. Earth Water Sky served as the system designer and integrator. To guests immersed in the 30-minute experience, the unrestored, non-working and in some cases broken signs will appear to be suddenly re-electrified, as though by magic, before their eyes. Up to 50 guests at a time will be transported directly into Las Vegas’ history, where the static signs come to life while accompanied by music from some of the entertainment industry’s most storied performers. Winslow, selected as one of Adobe’s 2016 – 2017’s Creative Residents, previously created a smaller-scale, one-night-only projection for the museum’s North Gallery last February. That work was part of a larger, site-specific series Winslow created called “Light Capsules,” where he uses projection mapping to revive “ghost signs”—unrestored, faded, no longer legible painted signs on buildings. After seeing his eye-catching artistry applied to its neon signs, the museum began discussions with Winslow about creating a permanent projection-mapping experience for visitors.